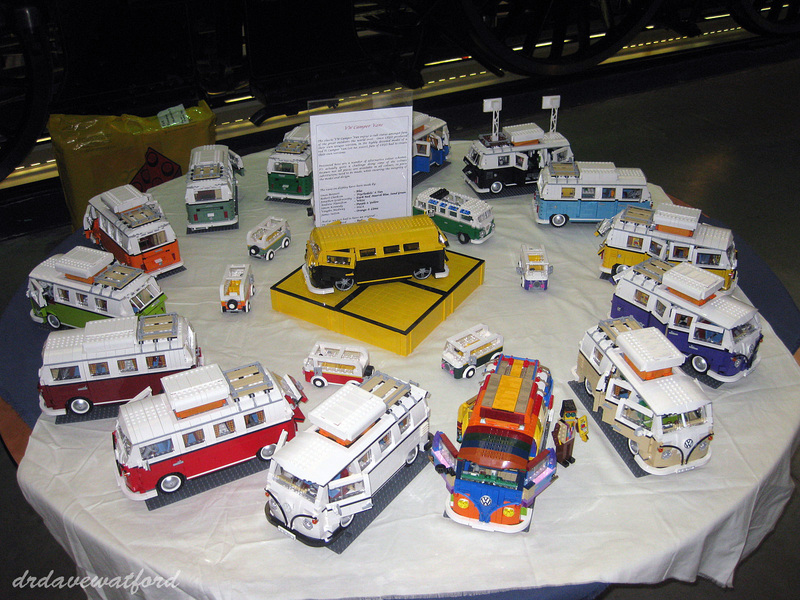 I plan on picking up a VW Camper Van set. But being me I'm going to want to change it's colour to something custom. It would be awesome if some bricklink sellers offered 10220 'customisation kits' which would basically be a set of the red outer bricks in the set from Lego, but in different and cool colours (assuming there are no special bricks in this part of the set). This would save me (and others) a lot of time and hassle searching for all the parts from a myriad of sellers, and paying multiple shipping costs. I'd pay a premium — an extra cost over the bricks themselves — to save myself this hassle. What does everyone — especially bricklink sellers — think of this idea? I can imagine an awesome version in Maersk blue (or similar), or bright orange. Looking forward to the set being released, I hope it makes it's way to Malaysia. Good idea. I may do this. I'm already planning on modding this vehicle in a couple of different ways. I'm thinking if painting the hubcaps chrome. But I'm afraid it might stand out too much. Might have to get a little creative to find some solutions, but it'd be neat to see! Hmmm, just noticed the hubcaps are already silver. I thought they were grey. Agreed - I don't think we'll be seeing this in Maersk Blue ! How are you guys getting the parts list before it's released? Or are you seeing some tricky pieces from the photos? I was just looking at the photos and seeing which red elements were there that were non-standard bricks or plates. When I did a cross-check of colors, the options were something like red, white, black, and dark blay. Red's obviously taken, and white/white wouldn't work too well. Black or dark blay would be... not quite in the same spirit, probably-- would be great if there were a nice vibrant color as an option. All I want is a minifig sized one. So I can't have a blue one resembling the DHARMA Initiative vans from LOST? ^That's exactly what I was thinking! It seems like Maersk Blue would be the perfect color for the DHARMA vans. After getting most of the blue bricks from our stash we still had to source extra pieces from pick a brick and bricklink. Three small design changes (hopefully not very obvious) and we have finished. I think it looks better than the original! A lime green would make it real retro - not sure if all the parts are available though. Thanks, so do I. We had a look at different colours but some of the special bricks aren't available. Lime green, yellow or orange would have been cool. No, but I did the 4X4 from the Horsefloat set in red and grey - not as nice as the original but a good-looking vehicle regardless of colour. Did you post an image? I'm not seeing any link. @paddypmt I love it. Is one of the substitutions the front wheelarch? Try Sand Green if you want a challenge! On the "to do" list for me, is a convertible 10187. With Side stud as you need so many of them! Has anyone else done a different colour van? The blue one is cool! Okay...now I have to pick up another VW camper to experiment with. It wasn't on my list, but now it is. Never got the 'rat' look myself... thats supposed to be how they start out before restoring them, not how they end up! I built a sand green version over the last couple of evenings. Quite a few substitutions, obviously, but all the doors open. I don't have the official set yet and didn't resort to bricklink, so there are no curtains in there or fabric in the roof. I only have 2 of the correct wheels on it at the moment, so will BL some of those. For the doors, I didn't use hinge bricks, since they're not available in sand green, so I used some black hinge plates in the black plate layer that separates the sand green from the white. The doors open smoothly and are easily supported by the hinge plates. The model's not quite right in a few places, but it's good enough. The colour scheme definitely suits this model. sounds great - pics, we need pics! And early bays too, not just splittys. ^^^^^ Love to see the piccies! ^^ That red and black 23 window Samba is just a classic. Looks like we are starting a Lego VW fan club here. Ok, I managed to find my way back into flickr. I've not been in there for around a year! Took a few pics this afternoon and uploaded them. At some point, I need to swap out some pieces, since there's some colour inconsistency. The others should be easy to find from there. Excellent, I like how you did the rear louvres and front wheel arches. You now need to leave it in the sun to get that ivory paintwork colour! I've just modified those louvres, so that I can quickly switch between the look in the pictures and a pair of 1x2 grille tiles mounted on a couple of 2x2 plates. From old look to new, I just slide a block out, remove the 1x2 plate with door rail from the van, replacing with a plain 1x2 plate and then slide in the grille block. Takes about 30 seconds to do both sides. Wow! You guys are inspiring with all those colors. Blue first, now Sand Green... what color next? Love the different colors, when we built ours I was saying I wonder if I could do this. I would love a lime green. Medium Azure mmmmm, yes please! Just need to wait for more types of bricks to come out. For this reason alone I can't wait til the next friends release. I couldn't wait for enough different parts to be available in medium azure, so went for Maersk instead. At the moment, macaroni availability is my starting point, which rules out a lot of colours, so I need to experiment with an alternative technique. Unfortunately, even when macaronis are available, some other features are tricky due to a lack of other parts. I'm still thinking about dark green. Green or yellow would be fairly easy though. ^ Check out about a third of the way down this page for a bit of inspiration. My wife wanted me to do it in orange but 5 elements aren't available and would have to redesign part of the van to replace them. As it happens I like it red and I did see the Brickish ones in the Glasgow store and they looked good too. I hope the pieces become available at some point. they seem to be largely curved pieces such as the 3x3 rounded corner plate and 2x2 rounded brick (macaroni piece) that are an issue...mostly. My wife wanted me to do it in orange but 5 elements aren't available and would have to redesign part of the van to replace them. Orange definitely possible, in some form.... Shame the front isn't visible in the pic below.